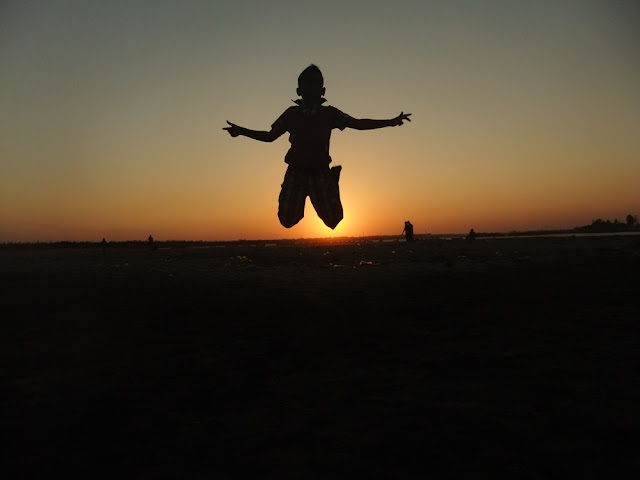 Once upon a day, while on a evening visit to the Silver beach in Cuddalore, I did the above silhouette of my elder kid Suriya jumping up while the sun is setting in the back ground. Ever since I did those shots --> story here; came back home; did a preview of the clicks on my home PC, my younger kid Lokashyam takes cue of the shots. I sensed his inquisitiveness. After a few months, we went to the beach. The sun was setting then, but I was not in a mood to do photography, instead wanted to sit on the sand and enjoy the breeze. But, little Lokashyam pesters me to do some clicks with him in the frame. He himself shows the place, a little away from the place we clicked earlier. This place was little swampy with back waters in the background. The wet mud there presented a slippery surface. Had a hard time to walk past this place. My little kid walks before me a bit faster out of his eagerness, so that he is in position for that silhouette. In the midst of all this, he skids on the slippery surface. I was walking five feet behind him, at a bit slower pace. I can't walk faster and reach him. If I try to go past him and catch him, I too may fall down . A little astonishment for me is that, he stands up on his own, takes some more steps to move further near the water. He once again falls down. I am helpless. I could not control him either. I was particular not to shout at him, because doing so, may spoil the evening and the photo shoot that is gaining a momentum goes off as well. But, I silently watch him walk, of course with mud on his back which had made him dirtier. After a little of confusion, he takes a spot and stands. This time, my elder kid Suriya goes near him and we ensured the little one, stands at a place which is not slippery. Lokashyam then checks on me; I get my camera out into action; I need to spell out One, Two and Three so that he jumps up in action; and the silhouette gets composed. And here are the memorable shots that we made. I could realize that he could not jump off higher. I had a little doubt, if he is having pain due to the fall he had. Got a little satisfaction that I could have this frame to satisfy him. So, I negotiate with him to finish the exercise. I still had a fear. Would he be suffering from pain due to the fall? Now, he gets satisfied that some good has come out of my clicks. He then comes near me as my elder kid Suriya, calls me for doing a shoot for him. As Suriya is past 8 years old, he can jump higher. I do not have any fear either. Also I am accustomed with him and am tuned with his rhythm. A shot well taken ! So, I am satisfied of having done some good shots for him to relish. The thing to be kept in my mind is that, these two kids have a plan in their mind and it should have come in the frame I clicked. So, if I am not clicking right, I would be forced by them to spend some more time doing the same exercise during the next visit to this beach. Now, Lokashyam, after seeing all the jumps made by Suriya, call me for a re-take. He has fine tuned his jumping style a bit. Caught the above picture and am sure that he is satisfied with the shoot. And I am satisfied that this little dangerous exercise concludes. Inquisitiveness had made him dirtier. But, I am not complaining. So, I am liking all these happenings! !